The 2017 Kia Optima Hybrid is an award-winning hybrid that is as elegant as it is efficient! Test-drive your 2017 Kia Optima Hybrid at Crown Kia Dublin today! Get behind the wheel of the 2017 Kia Optima Hybrid and drive with added peace of mind knowing it comes equipped with award-winning safety features designed to keep you and your family safe. Test-drive the 2017 Kia Sportage today at Crown Kia Dublin! We proudly serve drivers in Delaware, OH, Springfield, OH and their surrounding areas. 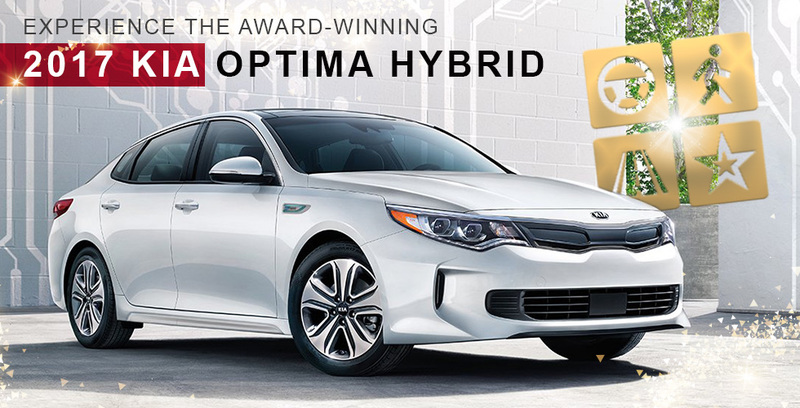 *The Optima Hybrid delivers more than just high efficiency. The standouts offer exceptional amenities, smart tech, and an enjoyable drive-all at a handsome price point. We'#39;re proud to announce that the Kia Optima Hybrid is one of the 10 Best Hybrid Cars Under $40,000 of 2017, according to Kelley Blue Book's KBB.com. With a plug-in hybrid you can drive 20 miles every day and never have to fill up with gas. But unlike an all-electric car, a plug-in hybrid can also hop from gas station to gas station on a cross-country road trip if the need arises. The following five standouts run the gamut from reliable, affordable Best Buy Award winner to Euro-performance wagon, and all of them are available for less than $40,000 even before factoring applicable tax credits. For more information, visit Kelley Blue Book's KBB.com. Kelley Blue Book is a registered trademark of Kelley Blue Book Co., Inc.